Some of the more tropical plants in my garden produce flowers that strike me as unreal. New Year’s Eve found me in the garden tending vegetables under a cerulean blue sky, wearing a sweatshirt and enjoying a bit of cool weather. December in South Florida can seem a bit dreamy. Beautiful beach weather for the most part, sometimes a bit foggy. Around town people can be seen surfing on the blue water… while pelicans dive into the river seeking a mullet for dinner. It also seems unreal to me that tomorrow ushers in 2018! Where did the time go? I can assure you that the flowers are quite real and from my garden. The orange, yellow and red flowers resembling Lobster Claws are from a Blanchetiana Bromeliad. 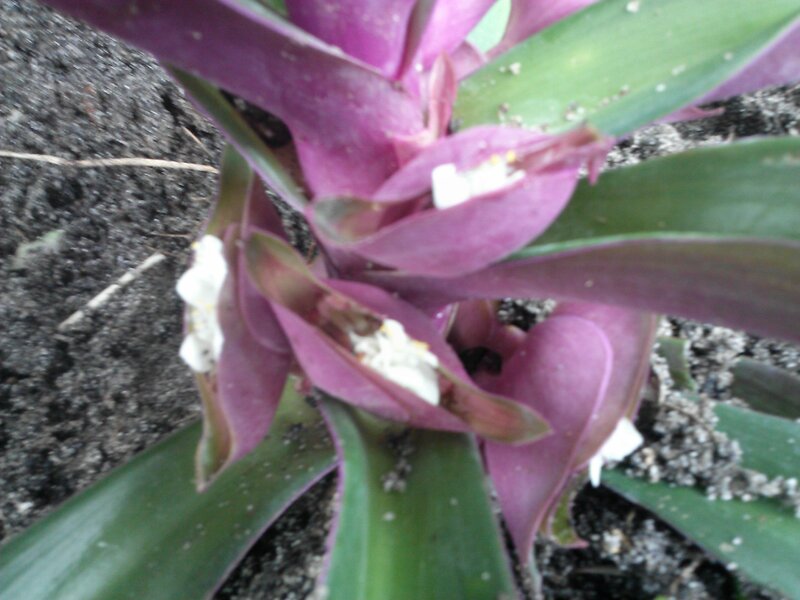 The Bromeliad itself is probably 5 feet tall and 6 feet across, the flowers are panicle like affairs that are about 4 tall and maybe 18 inches wide. I had cut the whole flower, then realized there were ants living in the stem. Quick work was made of cutting the ant hill off and leaving it in the garden. The balance of the flower was placed in my big crystal vase, forming a swirling base for some other flowers. The crystal vase, a wedding gift from a dear friend. The bells, to ring in the New Year, a favorite family heirloom of mine – my father brought them home from India, where he served during World War II. I have no clue what they really are, but my mother always used them on her wreath at Christmas. Since it is New Year’s Eve, my husband and I are preparing a special dinner. He is baking an Apple Pie, I am working on homemade Pasta for Smoked Fish in Creamy Tomato Vodka Sauce. The fish is Snapper caught and smoked by my husband, the sauce a decadent creamy vegetable sauce. For this we needed another flower arrangement. The centerpiece, in my mother’s Rose Bowl features Salvia: the peach Salvia is a seedling of the Tropical Red Salvia (S. coccinea) – there are named cultivars like this, however, this one is mine! The purple Salvia is Mexican Sage (Salvia leucantha). I had this plant as an annual further north and bought one late fall. It seemed annoyed, then started to flower. Orange flowers are from our Firebush (Hamelia patens). White flowers are Sweet Begonias (Begonia odorata), Dark red flowers are Shrimp Plants (Justicia brandegeana) and some Asian Sword Fern, there are also some Gallardia floating around in there.